Note: This blog post originally appeared August 24, 2015, on the Sport in American History blog. As of today, Middle Tennessee State University (MTSU) has a Confederacy problem. Granted, a lot has changed since the 1960s. For one, MTSU no longer has a man in Confederate garb on football sidelines, nor does the MTSU band play “Dixie” as the unofficial fight song. But there is still an ominous structure with “Forrest Hall” emblazoned upon its side, named after a Confederate general and slave trader. Why does this symbol to the Confederacy exist at MTSU? Why does it persist? And why did (and does) a state university founded 46 years after the Civil War proudly associate itself with a founder of the KKK? A few weeks ago, Matt Follett wrote a great piece for this very blog entitled “Confederate Iconography and Southern College Football.” In it, Matt connected Confederate imagery to sport through college football games in the South, primarily those at Ole Miss. In brief, Matt argued that administrative policies do not deter the display of Confederate flags at college sporting events or prevent “southerners from rallying and advocating for Confederate iconography.” In his words, “It appears changing the proverbial ‘hearts and minds’ of defiant southerners is a lost cause.” I like his use of the phrase “lost cause” here. This post is, first, a follow-up on Matt’s by analyzing the troubling—and ongoing—connections to the Confederacy of my current university, MTSU. 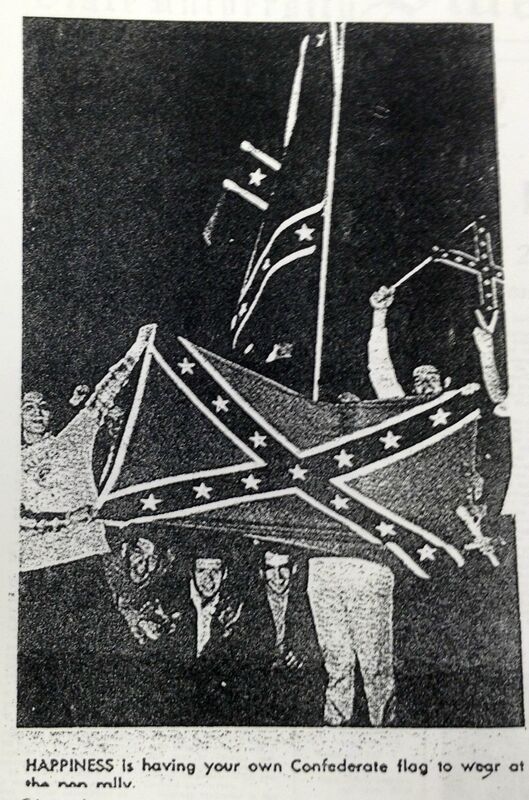 In the late-1960s and 1970s, MTSU successfully purged its brutally racist public image at sporting events, but remnants of MTSU’s racist “heritage” are still scattered throughout campus. By and large though, MTSU’s public image today is not significantly different from any other mid-sized public university with a mediocre football team…except for the fact that Nathan Bedford Forrest (one of the founders of the KKK) still has a symbolic presence on our campus. Second, this post is an effort to bring this historical context to a current (and ongoing) MTSU debate. 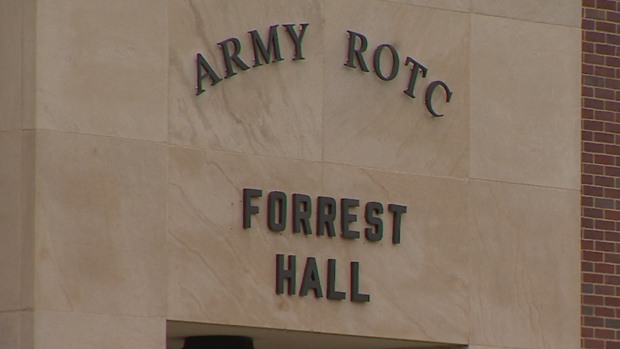 Like many universities, MTSU has an ROTC program; unlike most universities, our ROTC program is based in a building named after Nathan Bedford Forrest, a notorious Confederate general with no connection to the university whatsoever. As of this writing, current MTSU President Sidney McPhee is supposedly holding a series of meetings to “revisit” the name of Forrest Hall, as announced via public statement on 24 June, although there seems to be no administrative movement as of right now. However, there is absolutely student movement. A protest is scheduled for this Thursday. To be fully clear, I believe the name of Forrest Hall should be changed. This post is not a call for political correctness; it is a call for awareness, justice, and to end MTSU’s ahistorical association with a founder of the KKK. 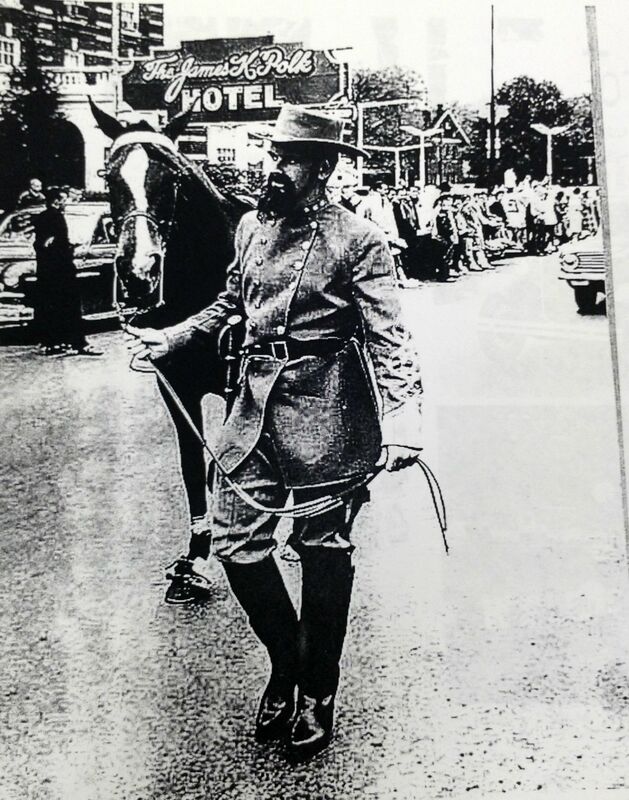 The MTSU Nathan Bedford Forrest mascot marches in the 1961 homecoming parade. A quick background on Nathan Bedford Forrest, for those of you unfamiliar. Forrest was a lieutenant general in the CSA Army and, by all military accounts of the time, led many successful military campaigns primarily in middle Tennessee. More importantly though, he was a slave trader, war criminal, and terrorist. Before the Civil War, Forrest made a fortune trading enslaved peoples; during the war, Forrest’s men brutalized Union soldiers, most notably massacring African-American Union soldiers at Fort Pillow after they surrendered; and after the war, Forrest became a prominent leader of the first Ku Klux Klan. Forrest defenders deny, many to this day, his role at Fort Pillow and the KKK and excuse his slave trading as a common practice in his day. But even in a best case scenario, Forrest was a violent, absolutist white supremacist, despite what the Sons of Confederate Veterans may have you believe about his changing views in his final years of life. Some argue that Forrest was a product of his times, which is of course true to a point, yet Forrest did things that very few Southern white men did at the time—made a fortune in the slave trade, massacred surrendered enemy soldiers, and led others in illegal, oppressive, and murderous action against African Americans. Forrest cannot be redeemed from this action just because he gave one half-decent speech in his dying days. I do not intend to debate Forrest as he lived; I do intend to analyze how Forrest has been canonized at MTSU. To be absolutely clear, there is no direct connection between Forrest and MTSU. Even at the dedication of Forrest Hall, the only connection that could be made was that Forrest’s command once “rendezvoused on or near the present campus.” No matter your opinion, you must agree this is a tenuous connection. Forrest died in 1877; MTSU opened (as Middle Tennessee State Normal School) in 1911. In 1913, a faculty committee chose the school’s official colors—blue and white—and explained these were chosen because the pair was practical, economical, and “could be purchased across the counter in any general merchandise store.” Newspapers unofficially named sports teams the “Pedagogues,” but this name was never popular on campus. In 1934, the local newspaper asked the student body for name suggestions. The winning submission was Blue Raiders, which still stands as the university’s mascot. A common misconception today is that the name “Raider” was derived from “Forrest’s Raiders,” but the winning entrant was actually a slightly modified version of Colgate University’s “Red Raiders.” As a relevant aside, it should be noted that “Rebels” finished just three votes behind in second place. While “Blue Raiders” may not be directly associated with Forrest, it was certainly implied within athletics by the end of World War II. For example, when the university considered a name change in 1944, the head football coach proposed the name Forrest State College to match the “Raider” nickname. 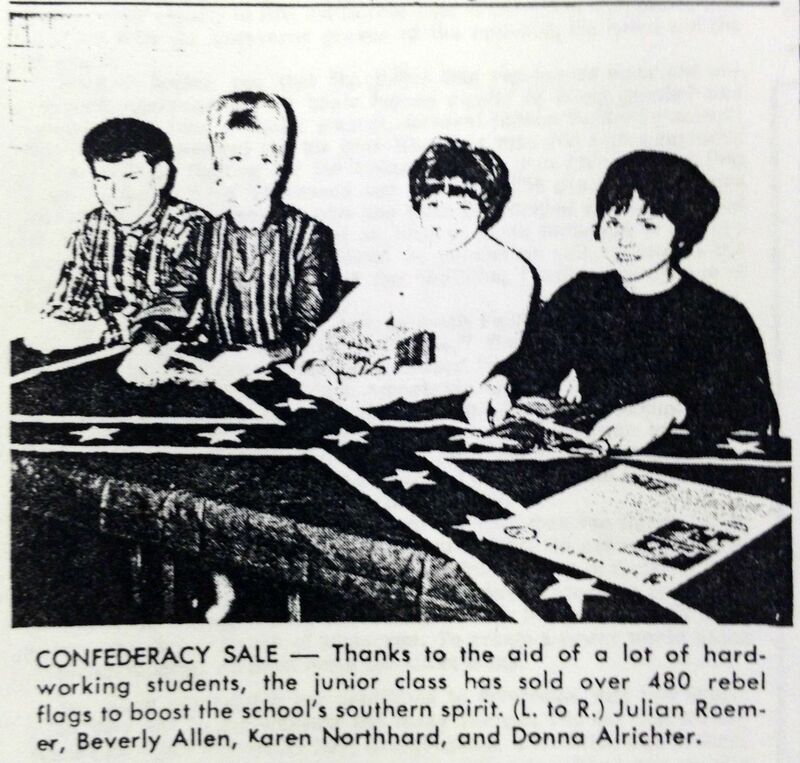 “Happiness is having your own Confederate flag to wave at the pep rally.” Sidelines newspaper, 31 Oct. 1968. At President Smith’s behest, MTSU’s publicity officers incorporated Forrest into their materials at least as early as 1945. By the mid-1950s, Forrest’s image dominated campus life, on decals, bookstore supplies, and campus newspaper Sidelines, not to mention the new ROTC building named Forrest Hall (also chosen by President Smith). Students formed a Nathan Bedford Forrest Club, and others sold “rebel flags to boost the school’s southern spirit.” Confederate battle flags were apparently everywhere on MTSU’s campus. Most visible though was the Forrest-lookalike mascot on horseback. From 1945 to 1967, “That Blue Devil” rode along the sidelines of MTSU football games at Horace James Field while “Dixie” played in the stands. Dixie wasn’t the official fight song, but the band played it often and it was clearly the favorite of most MTSU fans. While Confederate symbols were popular amongst the all-white student body at this time, it did not sit well with everyone. For example, the student who won the mascot contest with “Blue Raiders” in 1934 did not appreciate the new interpretation of the mascot, openly speaking on the Forrest symbolism: “One [memory] that I didn’t like was when one of the presidents and one of the public relations men decided they needed a reason for the name.” Most likely, the Forrest imagery was a tactic utilized by Smith (and others) to suppress integration efforts and the nascent Civil Rights movement on the then all-white campus. MTSU classrooms finally integrated in 1962, with athletic integration coming three years later when the first African-American athlete debuted on the track and field team. Three more years later, in 1968, J.W. Harper became the first African-American player on MTSU’s football team, but even at this late date the football locker room and dormitories remained segregated. Keathley University Center with Nathan Bedford Forrest seal. Sidelines newspaper, 4 Mar. 1968. While black students were first taking classes and competing for MTSU sports teams, the university furthered its attachment to Nathan Bedford Forrest. 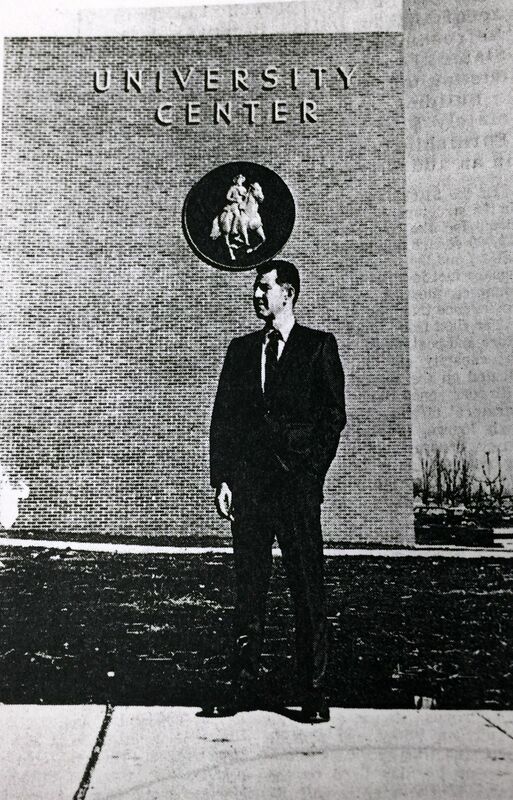 In 1967, MTSU built a new student center, and on the outside of that building was placed a large seal of the university’s official mascot–Nathan Bedford Forrest on horseback. This was not received well by much of the student body, especially the small but growing African-American population, as evidenced by a spontaneous student tradition of casually pelting the seal with rocks when walking past. During the next year, with rights movements seeing hard-fought success nationwide, the student body at MTSU spoke up. Sylvester Brooks, an African-American MTSU student, wrote an article appearing in the campus newspaper asserting that Forrest symbols were offensive—and oppressive—to MTSU’s African-American students. A large number of responses sympathetic to Brooks’ points poured into the newspaper, and a student-led campaign launched aspiring to remove the Forrest and Confederate symbols at MTSU. In response, MTSU President Smith’s successor, M.G. Scarlett, formed a committee to decide the next mascot for sporting events. This committee decided to select a new mascot that “would not recall the elements of the Civil War and be more palatable to the minorities on campus and in the community.” The committee chose to do away with the Confederate Blue Raider for a more neutral, somewhat cartoonish cavalry uniform. A few different dogs were also used as game day mascots for a while. The Forrest mascot was never seen again, but was not officially replaced until a 1976 MTSU football game with the debut of “a more modern figure”–a Tennessee walking horse named Wink’s Choice. A horse mascot was not long for football games however; Wink’s Choice had a hard time walking on the track surrounding the field, so the equine mascot was quietly discarded as well. The debut of Wink’s Choice as MTSU’s new mascot, Raider I. The Mid-Stater, MTSU, Fall 1976. 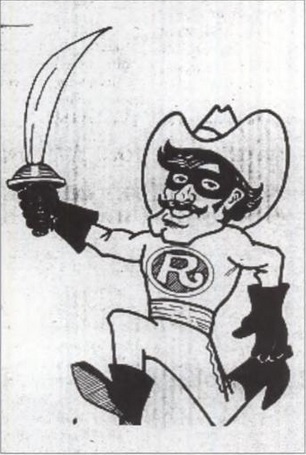 The “superhero” Blue Raider debuted in 1978. But of course, this was not the end of MTSU’s attachment to white supremacy. 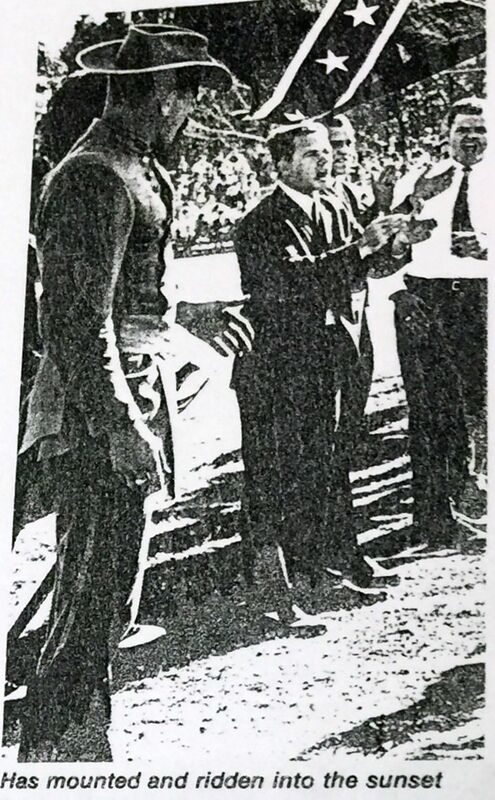 On the night of 11 Dec. 1970 and during this mascot transition, white MTSU students burned a cross on campus. About sixty black students immediately marched to President Scarlett’s home and demanded action. A week later, Scarlett addressed the campus and demanded an end to all racism at MTSU. Scarlett would go on to “persuade” university fraternities from wearing and displaying Confederate flags at football games and the marching band from playing “Dixie.” The Music Department penned a new MTSU song, although they were not pleased with “altering a traditional aspect of MTSU’s cultural heritage” (even though the song was hardly an MTSU tradition). Throughout the 1970s, President Scarlett slowly replaced Forrest imagery with more neutral symbols, such as when, in 1978, the university seal was officially changed from Forrest on horseback to MTSU call letters. MTSU ordered yet another sports mascot—some type of strange-looking swashbuckler that some even described as a superhero. And thus, a burning cross and the subsequent outrage precipitated the death of the MTSU’s open attachment to Confederate symbolism. To be clear though, Scarlett wasn’t exactly a champion of civil rights; he was more a champion of good publicity. Scarlett would in coming years, for example, suppress media coverage of student protests and arrests, hoping to project an image of MTSU as calm, safe campus during a time when many college campuses experienced highly publicized protests. By the mid-1980s, there were three symbols of Forrest left on campus: athletic department stationary, the university seal on the student center, and the Forrest Hall ROTC building. Stationary was phased out over time; the seal was unilaterally taken down by another MTSU President in 1989 and donated to Nathan Bedford Forrest State Park; but Forrest Hall persists. In 2006, a student movement emerged aspiring to change the name, and the student government agreed–only to reverse its decision a few days later. The Nathan Bedford Forrest mascot during one of its last appearances, on-field at an MTSU football game ceremony. But, as seen here, MTSU’s connections to Forrest are tenuous at best and bear no validity. If the connection to Forrest is valid, then why doesn’t MTSU mention Forrest a single time in official histories? Why did MTSU quickly sever ties with Confederate symbolism during the late-1960s? Why does the most recent published history of MTSU refer to the mid-century attachment to Forrest as a “passing fad”? Almost entirely because of student protest and public outcry, MTSU Presidents consistently re-evaluate the appropriateness of Forrest connections around campus. More often than not since 1970, they conclude that Forrest is bad for business and that it projects an image of white supremacy (and they are correct in that conclusion). Further, student government has proven to be an utter failure at least twice now in successfully removing a Confederate tradition foisted upon them by a President Smith seventy years ago. It is now up to President McPhee to tacitly accept a false tradition foisted upon us by Smith or to be an agent of positive change like President Scarlett was in the 1970s. When MTSU built its ROTC building in 1954, President Smith named it Forrest Hall in honor of Nathan Bedford Forrest’s reputation as an “intrepid Confederate cavalry leader who won fame with his brilliant raids.” Maybe that was Forrest’s reputation in 1954, but in 2015 Forrest’s reputation is one of hate, racism, and violence. We do not want or need that at MTSU. I urge students, staff, faculty, and anyone who cares about MTSU to finally rid the university of this last blatant symbol of the Confederacy on campus. Note: I would like to thank the staff of the Albert Gore Research Center at MTSU for their generous assistance in researching this article. Josh Howard is a PhD Candidate in the Public History Program at Middle Tennessee State University. His research interests include sports history, Appalachia, and public history. His ongoing dissertation research explores the use of informal data collection techniques in museum visitor studies. Most recently, he completed a web exhibit and archive based on the Wendell Smith Papers for the National Baseball Hall of Fame and Museum. He is also the social media editor for this blog. Get in touch with Josh at Joshua.Howard@mtsu.edu or on Twitter via @jhowardhistory. Middle Tennessee State College Dedication, 25 Mar. 1958. “The Mid-Stater Alumni Bulletin,” MTS College, Vol. 1, No. 2, Spring 1960. Lisa Pruitt, Holly Barnett, and Nancy Morgan, editors, Middle Tennessee State University (Charleston, SC: Arcadia Publishing, 2001), 68. “The Mid-Stater Alumni Bulletin,” MTSU, Fall 1984, 9. “Everything but Confederate Money,” 1968, Albert Gore Research Center. The Mid-Stater Alumni Bulletin, MTS College, Vol. 1, No. 2, Spring 1960. Matt Bolch, “Raider name evolved, but not without controversy,” Sidelines, undated . Brooks interview. Transcript, Sylvester Brooks Oral History Interview, 30 Sep. 2000, by Erin Toomey, 26, Albert Gore Research Center. “The Mid-Stater Alumni Bulletin,” Fall 1984, 9. MTSU Diamond Anniversary, 7 Sep. 1976. “The Mid-Stater Alumni Bulletin,” Fall 1976, 17. Erin Edgemon, “Scarlett put MTSU on path toward change,” DNJ, 1 Jun. 2004. Gwynn Thayer, Gordon Belt, Taffey Hall, and Nancy Morgan, “MTSU Confederate Symbolism Documentation Project,” Appendix A, IMG_0695. Middle Tennessee State College Dedication, 25 Mar. 1958, Pittard Collection, Albert Gore Research Center.